It's no exaggeration to say that Nightmares On Wax’s work is synonymous with a place in time. It is a place individual to those who have savoured his popular brand of sun-drenched dubbed out soul, where fragments of hazy memories, halcyon days and past snapshots encapsulate a generation’s sofa sojourning. 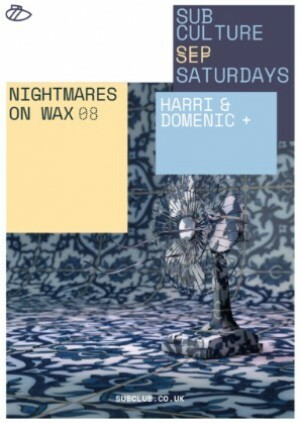 Nightmares On Wax's historical career spans that of a similar timescale of Sub Club, with the club opening in 1987 two years before Nightmares on Wax dropped their debut single 'Dexterous' in 1989. It's safe to say that a lot can happen in the space of nearly three decades. After countless direction and line-up configurations, Nightmares On Wax belongs solely to founder George Evelyn - a man who can reportedly 'bottle sunshine'. With the N.O.W sound deep-rooted in hip-hop, Evelyn uses those roots as a base to traverse a wide range of music styles including electronica, disco, soul, house and afrobeat. What is the Handling Charge for? To ensure tickets are delivered safely and securely and to keep the price as low as possible for you, the ticket buyer, Sub Club generally uses our E-ticket system unless otherwise stated. For this service we charge a small Handling Fee to cover the debit/credit card processing fees, customer services, processing and distribution of tickets and our secure server costs. We always try to keep these costs to an absolute minimum. If you feel at any time that our prices are not fair or competitive we'd be happy to hear from you. If you have ordered physical paper tickets there is a further Delivery cost added to cover the delivery of your order through the Royal Mail network. We always endeavour to keep these costs as low as possible to merely cover the costs of postage. We only charge you one Delivery cost per order so if there is a big group of you recommend purchasing larger amounts in one order. When you purchase tickets through Sub Club, the full face value of the ticket is shown. This price is the price set by the event promoter and we pay this full amount to the promoter without any deductions.